The choir works from the Scandinavian male voice choir tradition which opens up to the large repertoire the Nordic composers have contributed to. The choir rehearses works by Peter Heise, Lange-Müller, N. W. Gade, Carl Nielsen, C. M. Bellmann, Grieg and Sibelius, to name but a few. The choir has through time supplemented the Nordic repertoire with many different works by composers from all over the world, spanning medieval churc music to American barbershop and swing. We emphasise artistical development as well as challenging new and old singers so we can ensure a high level of enthusiasm. The choir consist of 30 active singers aged 23 to 80. One singer has been with us from the start in 1930! We rehearse eveery Tuesday evening and supplement with practice weekends before an important concert or international engagement. 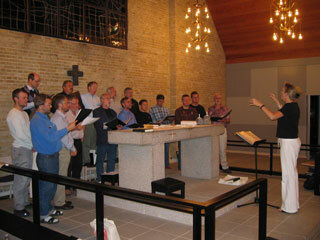 Aarhus Student Singers continue the tradtion of giving many concerts in Denmark and abroad. The choir gives between 5 and 10 concerts annually and perform internationally approximately every other year. The international engagements have e.g. brought us to USA, Iceland, Holland, England, Russia, Italy, Austria, Bulgaria and Estonia. 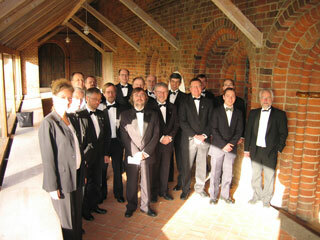 Moreover, we join with other Nordic univeristy choirs in touring Scandinavia. The goal, with regards to the travels and concerts, is to deliver a different musical experience to the audience, to introduce the Scandinavian male voice choir tradition to people and also to experience other cultures from a singing and musical standpoint. 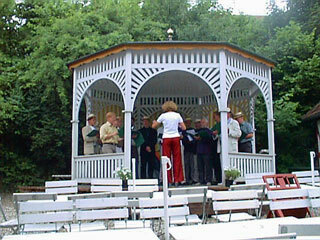 Summerkoncert in "Den Gamle By"